President Rodrigo Duterte has signed an Executive Order mandating full public disclosure of all offices under the executive branch, Communications Secretary Martin Andanar announced Sunday, July 24. Speaking in a press conference in Davao City, Andanar said Duterte signed his second EO on Saturday, July 23, at 7 pm – two days ahead of his first State of the Nation Address (SONA). 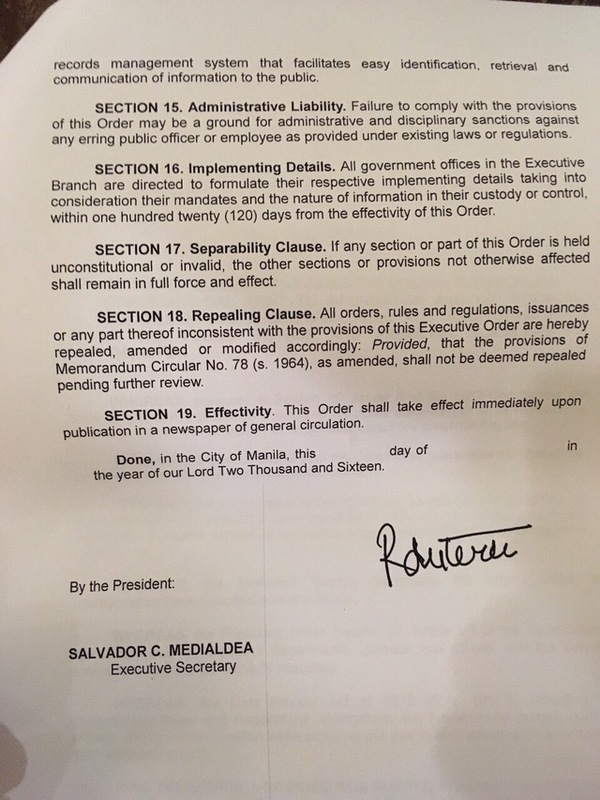 Local government units are also encouraged to “observe and be guided by this order,” according to the EO. The law also “reminds” public officials to file their Statement of Assets and Liabilities and Net Worth (SALN) and make it available for public scrutiny. Filipinos may request for needed information through a letter of request sent to the concerned office along with a valid proof of identity. No person requesting for information shall be denied access unless the information sought “falls under any of the exception enshrined in the constitution existing law or jurisprudence,” the EO stated. The Department of Justice (DOJ) and Office of the Solicitor General (OSG) must provide a list of exceptions that must be submitted to the Office of the President within 30 calendar days within the effectivity of the EO. The DOJ and the OSG will also serve as the oversight bodies that will decide on requests for information that may affect national security. If the request clearly does not fall under the exceptions identified, the office concerned should grant and release the request within 15 days, the EO stated. Heads of agencies and officers who fail to abide by the EO will face administrative cases, Andanar said. But while the signed EO is a landmark action in the long fight for FOI, advocates still push for its legislation in Congress since the measure only covers offices under the executive branch. “We hope that this new administration will continue to pursue the enactment of a complete Freedom of Information Law through legislation, with provisions requiring access to particular documents and data in ALL levels of government, penalties for public officials and employees who deny such access, and other components that will truly guarantee transparency, accountability, and people’s participation,” FOI Youth Initiative said in a statement. A progressive youth group, meanwhile, lamented the limitations of the president’s order. “We note, however, that the new EO also has many limitations. For example, it clearly states that it will not cover ‘exceptions enshrined in the Constitution, existing law or jurisprudence.’ As such, limitations such as the invocation of ‘executive privilege’ and national security are still there – exceptions that we duly fought against in the crafting of an FOI bill in Congress,” Kabataan Party-list said. The FOI saw a push in the 16th Congress when the measure was passed by Senate on March 10, 2014 on third and final reading. But the House of Representatives failed to pass its version for concurrence despite former President Benigno Aquino naming it as one of his legislative priorities for 2015. Asked if the new EO will push for FOI’s passage in Congress, Andanar said Duterte believes in the separation of powers of the executive and legislative branches. But presumptive House Speaker Pantaleon Alvarez told fellow lawmakers on Friday, July 22 that FOI bill will still be a priority even after Duterte signs the EO.